Q. What do you get when you take a commission-free world, stir in pensions freedoms, automatic enrolment, FAMR, some digital disruptors and now LISAs to the mix? A. We can’t find anyone who has worked out the answer to that riddle. These days, most people at least agree that the starting point has to be the customer. 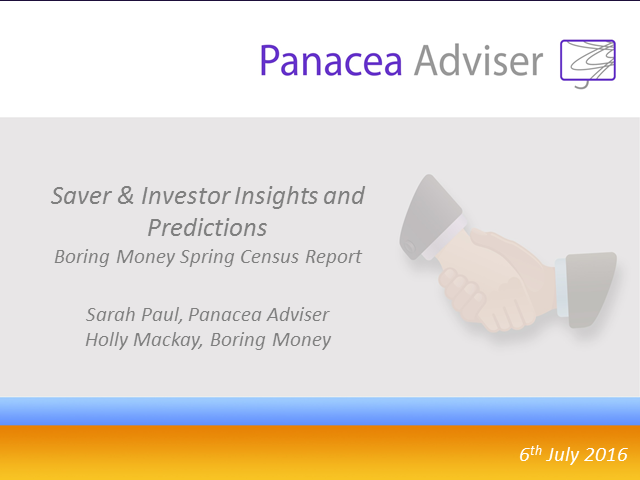 As a result, Panacea Adviser is delighted to team up with Holly Mackay from Boring Money for their next Bento for One Webcast. Using data from the Boring Money website, YouGov, non-financial customer-facing businesses and financial providers, Boring Money will be discussing its first Census report. This report will provide unique insights into British savers and investors and can hopefully help answer that riddle. Or at least make a prediction.